Mexico City - May 27, 2011 - Mexican Federal Deputy Gerardo Sanchez García and Senator Adolfo Toledo Infanzón have presented a motion in the Congress demanding that the Minister of Labour and the Minister of Foreign Affairs provide an explanation about alleged anti-union activities of the Mexican government against Mexican migrant agricultural workers in Canada. 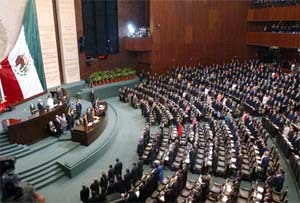 The motion by the two legislators, introduced on May 25, also recommends that the Mexico federal government recognize the support that UFCW Canada has provided over the past two decades to Mexican migrant workers in Canada, and to respect the Freedom of Association rights guaranteed to all workers in Canada under the country's Charter. The legislators are also calling for the development of new, proactive policies regarding temporary foreign worker programs that respect the fundamental human­­­ and labour rights of Mexican workers who toil abroad. On May 18, at a press conference organized by the liaison office of UFCW in Mexico, Senator Toledo Infanzón and Deputy Sanchez García joined a group of workers, academics and union leaders to support the UFCW Canada complaint against the Consulate of Mexico in Vancouver for anti-union activities. The evidence presented before the Labour Board in British Columbia showed the existence of black lists to prevent active members of the union from returning to work to Canada under the Canadian Seasonal Agricultural Workers Program (CSWAP). UFCW Canada is the country's largest private-sector union, with more than 250,000 members working primarily in the food production and food retail sectors. UFCW Canada, in association with the Agriculture Workers Alliance (AWA) operates ten agriculture worker support centers across the country.